A Megalithic passage tomb dating back some 5,500 years has been discovered at the 18th century Dowth Hall in Co Meath. The discovery, described by archaeologists as "the find of a lifetime" is within the Brú na Bóinne World Heritage Site. It was made during an excavation carried out by the agri-technology company Devenish in partnership with University College Dublin School of Archaeology. To date, two burial chambers have been discovered within the western part of the main passage tomb, over which a large stone cairn (c.40m diameter) was raised. The six kerbstones that have been identified so far would have formed part of a ring of stones that followed the cairn perimeter. One kerbstone is heavily decorated with Neolithic carvings and represents one of the most impressive discoveries of megalithic art in Ireland for decades. During the course of this project, a further two possible satellite tombs were also found. 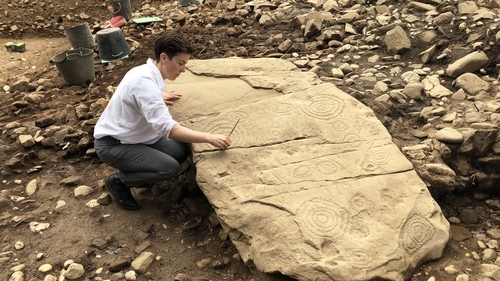 Dr Clíodhna Ní Lionáin, Devenish's lead archaeologist for the project said: "For the archaeologists involved in this discovery, it is truly the find of a lifetime." Dr Stephen Davis of the UCD School of Archaeology said today: "This is the most significant megalithic find in Ireland in the last 50 years, since the excavation of Knowth. "The spate of archaeological discoveries in Brú na Bóinne in recent weeks highlights what a globally significant place this is." Speaking about the company's presence at Dowth and the importance of its heritage, Owen Brennan, Executive Chairman of Devenish said: "Devenish invested in this farm at Dowth because of its fertile soil, its location beside the Boyne and its beautiful landscape. "From our archaeological research, it seems we made the same decision for the same reasons as a long line of our farming colleagues from the Neolithic, the Bronze Age, medieval and more recent times. "The monuments here, created by some of Ireland's first farmers, capture our imaginations and those of our visitors to the Devenish Lands of Dowth. It is an inspirational landscape to showcase Devenish's work on sustainable agriculture and promoting human health through nutrition."